No, this isn't Batman out on safari. It's the 2035 ZAIRE concept car, an advanced all-terrain vehicle designed for National Geographic's photography team. Assuming this badboy actually gets developed, it'll help the photographers traverse the often challenging and unpredictable African terrain. All images via Yanko Design. Designed by Dong Man Joo. The car can seat up to five members and is equipped with a number of advanced features, including a unique transforming maglev wheel system and a seat that can extend high above the vehicle. From the designer: "The vehicle is based on an innovative mechanism, as it possesses both frequency abilities and previous wheel mobility. Since it heads towards the hexagonal direction of greenhouse, it has been designed so that more diverse directions can be filmed. In addition, it has been designed in the way that it possesses spacious interior space with very wide left-and-right body and safe un-turning position." 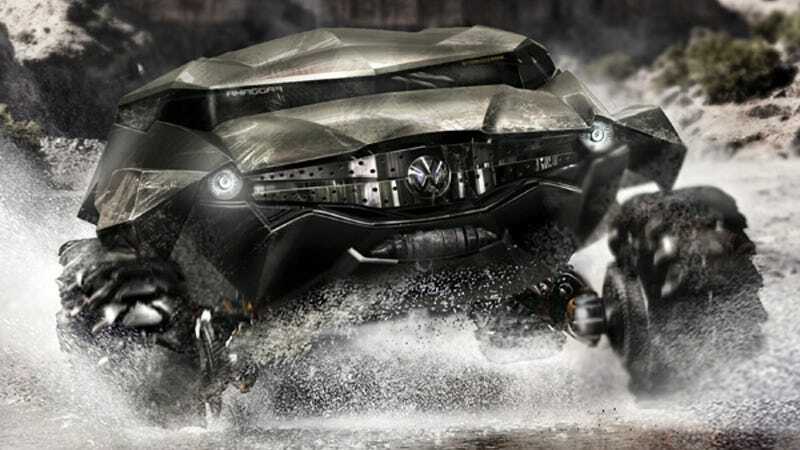 Designed by Volkswagen, the chasis can remain relatively horizontal even when driving at extreme angles. Its suspension system "allows for movement similar to human joints."